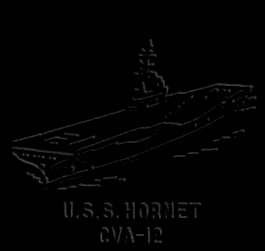 "USS HORNET CV-12 CVA-12 CVS-12 A Pictorial History"
Chuck Self has out done himself with this book, he captures the history of this great ship from its conception, right down to its final resting place, Alameda, California. With over 450 pictures, illustrations and ship patches, showing her while in service, deteriorating in mothballs, and after having some of the restoration completed. Also included is the history of troubles undertaken to save this ship from the breakers, as well as a brief history on the previous seven ships named HORNET. This book is truly awesome.